Inspired by those stary nights with clouds… hiding and revealing in the sky a rainbow of colorful stars. What includes the Addon FatPack? 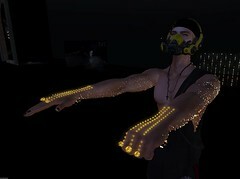 Posted in Animated mesh particles lights, appearance, E.V.E Studio, News, Second Life, wardrobe and accessoriesTagged E.V.E Studio, FaMESHedX, mesh glitter suit, Noctiluca, stars body mesh suitBookmark the permalink.